The error points to the fact that the Spooler service cannot start because a Lexmark LexBceS Server service is still being looked for, and it isn’t there because there is no Lexmark software left on the PC. The Spooler will not start until it is told not to look for the missing Lexmark service. In Vista or 7 click the start orb, type cmd into the search box. Right click on the cmd icon and select Run as Administrator. In XP click start, click run, type cmd and press Enter or go to All Programs then Accessories and then click Command Prompt. Look at Dependencies and see if there is anything listed apart from RPCSS. HTTP may be listed there as well, that’s OK. Looking at the screenshot, you can see the Spooler service is still depending on a Lexmark service called LexBceS so will throw up the cannot start service error. 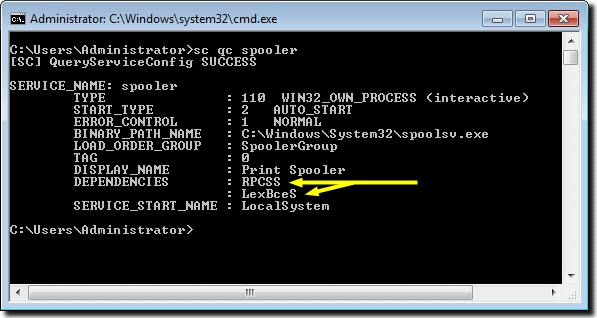 Type sc config spooler depend= RPCSS (note the space after =) and press Enter. You should then get a success message. This means the Spooler service now only looks for the presence of the Remote Procedure Call (RPCSS) service which is the default behavior. Type net start spooler and press Enter. After a short delay, the Spooler service should start meaning the error has now been rectified and you will now be able to use your non Lexmark printer. Whether you have had this problem or not, if you have owned a Lexmark printer but don’t use it now and no longer have the related software installed, it still might be worth checking for the existence of the LexBceS Server service dependency to prevent any potential issues related to a spooler service error in the future. tx very much for this simple and easy to understand fix. When you type in ‘sc config spooler depend= RPCSS’ any dependencies already there will be wiped away to only leave the default setting of RPCSS.